For all of us dedicated to equality this is a momentary setback for we have only just begun! From the Los Angeles Times - "Marine Staff Sgt. 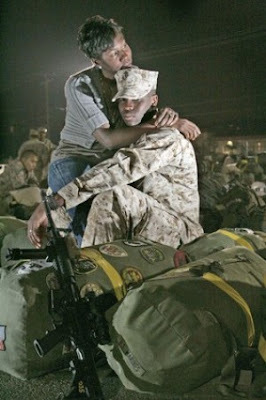 Ryan Gray and his wife, Alexsia, share a moment at Camp Pendleton before his recent deployment to Afghanistan. He wants her to make “what if” plans in case something happens to him." As a Jersey boy, when life gets rough I tend to "turn the radio way up loud, so I don't have to think." And I tend to turn to my (slightly) older brother for his wisdom and comfort. Now it's my turn to offer a strong back and a shoulder to lean on. Life can seem cruel, unfair and oh so brief. I deeply understand the pathos when Bruce sings, "As soon as you got something, they send someone to try and take it away." Kent, maybe because he was born in Virginia, rather than in the state that became known as much for its factories and boarded up cities, would reject the cynicism in that line. Kent having learned much from our Marine Corps dad, instead, finds hope no matter what life throws his way and Kent knows how to soldier on. Kent's son Luke received a double lung transplant a year ago and has a had a remarkable 12 months. Luke's courage and sweet good humor has carried him on incredible adventures. But, Luke has hit a rough spot and is in the ICU at UW in Seattle. Luke and Kent and Kent's wife Cathy and their daughter Ali need all the love and support they can get at this time. Kent is a masterful poet and has introduced to me and my son, a world of words and images. My brother, I love you and am in awe of your courage and patience, and in your rough hour I give you the words of a Jersey street poet and a Welsh writer - Springsteen and Dylan Thomas. One of a series of four new pennies honoring the bicentennial of Abraham Lincoln's birth was released today. The design was sculpted by artist Charles L. Vickers for the United States Mint. 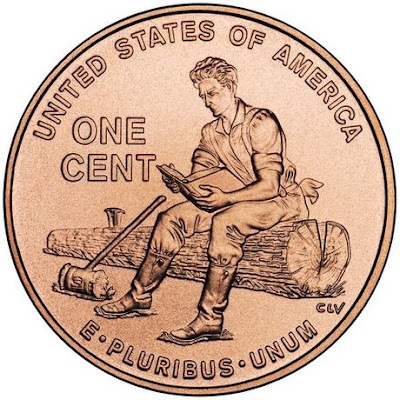 On the reverse side of Vicker's new penny is a low relief of a young Abraham Lincoln sitting on a log reading a large book. It seems that Lincoln has found his true calling in the realm of words as he takes a break from his rail splitting duties in Indiana. Vickers has created an inspiring image that speaks as much of our time as Lincoln's. With high school drop out rates at 20% in California it is nice to be reminded daily that the mind needs to be exercised as much as the body. 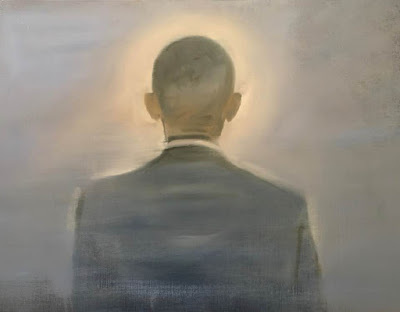 Lincoln's story is inspiring and as a nation we are fortunate that President Obama understands Lincoln's legacy. Sculptor Charles L. Vickers' story is inspiring as well. Vickers served with the 101st Airborne Division before heading off to New York in pursuit of his dream to become a professional artist. Vickers studied at the Art Students League, the Frank Reilly School of Art, the Pratt Institute and the School of Visual Arts. Not all art careers begin with an MFA. Much like young actors, many young visual artists find their way through a series of lessons and classes rather than a degree program. 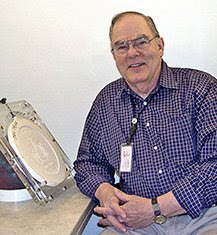 "Since leaving as a Senior Sculptor in 1985 and establishing his own studio, Charles’ design work has earned him recognition throughout the world and he has been commissioned to work on many private collections"
We are fortunate that Charles L. Vickers joined the United States Mint’s sculptor-engraving staff in December 2003. In the future when I hear the change rattling in my pocket, I will be sure to pull out the coins and see if Vicker's Lincoln is journeying with me. Now in its 30th year, the Venice Art Walk & Auctions has raised millions of dollars for Venice Family Clinic – largely through the Silent Art Auction, which offers great deals on original and limited-edition works by the biggest names in the Southern California art scene. 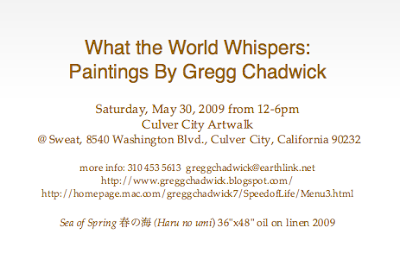 My painting is up for bidding on Sunday, May 17, at Westminster School, 1010 Abbot Kinney Blvd., in Venice. What Lies In the Shadow of the Statue? ~ Ille qui nos omnes servabit. The statue is of Tawaret the goddess of protection during pregnancy and childbirth. Temple of Haroeris and Sobek, Kom Ombo, copyright by Gary Jones. 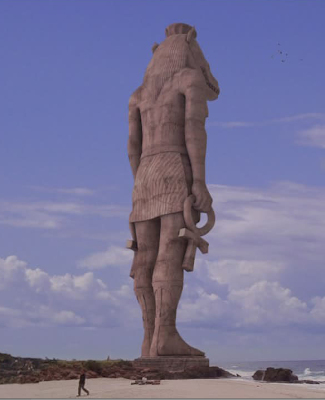 The Egyptian god Sobek seems to be the inspiration for the giant statue on LOST. I was leaning towards Anubis but the crocodilian snout gives it away. (Anubis was probably a bit too close to Stargate anyway.) Gary Jones' masterful photo of the Temple of Haroeris and Sobek in Egypt shows Sobek in detail. The light in Jones' photo is stunning - mysterious and beckoning. "Having the form of a crocodile, the Egyptians believed that he also had the nature of a crocodile. He could be the strong, powerful symbol of the pharaoh, showing the ruler's might. He could use this force to protect the justified dead in their after life, and be the protector and rescuer of the other gods... yet he could also use that power to savage his enemies and the sinful deceased. He could bestow sight and senses to the dead, he could bring water and fertility to the land." Just in time for the release tomorrow of the film Angels and Demons, we have Richard on LOST answering questions in Latin and calling himself Ricardo. Latin of course brings to mind the Catholic church and the history of Rome. Could Richard be a priest? Is he also known as Father Ricardo? 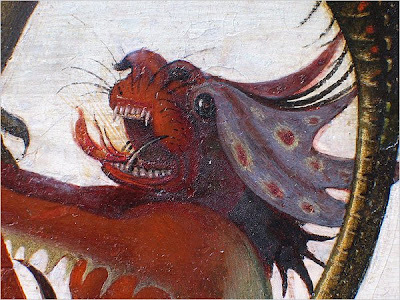 Is this the Earliest Known Painting by Michelangelo? 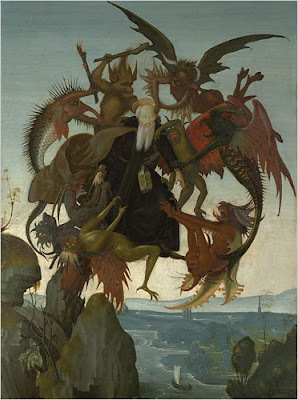 The Torment of Saint Anthony c. 1487–88. Oil and tempera on panel, 18 1/2 x 13 1/4 in. 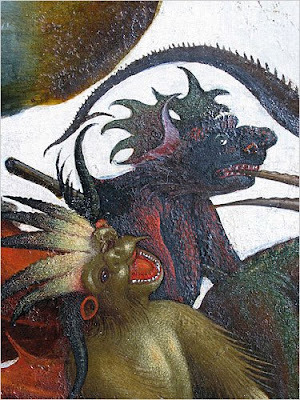 Ascanio Condivi describes in his biography of Michelangelo how the young artist visited the fish market to study the detailed overlapping of fish scales to provide verisimilitude to his version of Schongauer's demons. 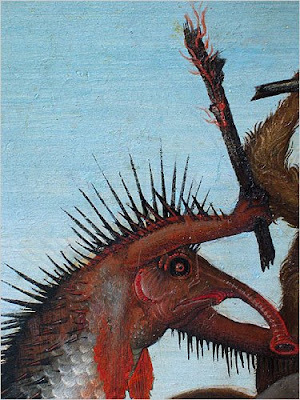 Details of The Torment of Saint Anthonyc. 1487–88. Oil and tempera on panel, 18 1/2 x 13 1/4 in. Michelangelo's Torment of Saint Anthony will be exhibited at the Metropolitan Museum in New York from June through August. 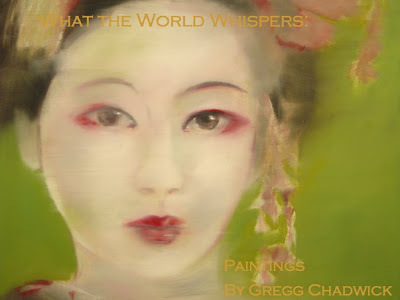 The painting will then travel to its new home at the Kimbell Art Museum in Fort Worth, Texas. 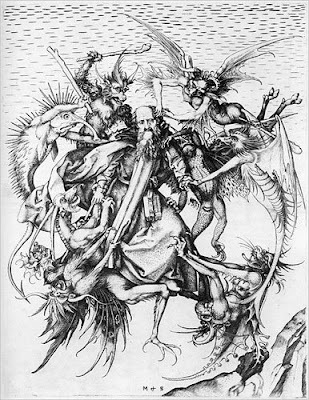 The painting will be hung alongside an edition of Martin Schongauer's engraving, reuniting inspiration and creation. By the Hand of a Very Young Master? Reading Craig Arnold's Poem "The Singer"
the trace of a brave thought in the face of sadness. On the small volcanic island of Kuchino-erabu off the coast of Japan, American poet Craig Arnold became lost and searchers have now concluded that Craig vanished over the side of a cliff into the unknown. It is sad whenever a life is lost but even more so when an artist in his youth leaves so much undone for us to only guess at. We are left to carry on in Craig's artistic spirit.